Create a modern extension that stands out from the local crowd by choosing Castle Conservatories as your installer in Surrey. We have the knowledge and experience needed to make your project the success it deserves to be. What are your options when designing a modern extension? If you want to remove interconnecting doors from your design plans, your structure will need to meet building regulation rules in relation to thermal efficiency. Do you need a modern extension because you’ve run out of space? Or simply want to add value to your home in Surrey? Then we can design contemporary-looking rooms that can be used for a range of purposes and which will make a great first impression. In this short modern extensions guide, we’ll discuss the options that we offer and answer your questions in greater detail. You can explore our modern extensions by using our new Virtual Reality Tour tool. When you’re ready, call or email our team to find out more. Find the inspiration you need for your modern extension project by looking in more detail at two of the products that we offer. Our Designer Conservatory uses a glass conservatory roof as the basis for its design. You’ll benefit from plenty of light if you choose this option, which is ideal for smaller builds that might otherwise feel enclosed. Externally, super-insulated columns give that all-important modern extension feel, while improving thermal efficiency levels by five (when compared to a masonry construction built to the same dimensions). The super-insulated columns are internally plastered to make your conservatory look and feel like a modern extension of your home. An insulated pelmet, which can include lighting and speakers, further enhances this effect. Hide your guttering and create eye-catching sightlines by adding a decorative aluminium cornice to your modern extension. Our cornices are available in a flat or curved format to suit the demands of your Surrey project. Choose full-height glazing to flood your modern orangery extension with light and connect your Surrey home to the outdoors. The roof system that comes with this stylish option in our portfolio allows for wide-spans up to 6.5m. Why not include a patio or bi-fold doors in your design plans. These styles of doors open wide to create unbroken views of the outdoors while creating convenient access and exit point that will come into its own when your home is busy. As with our Designer Conservatory, your modern extension can include stylish and thermally efficient super-insulated columns that’ll lower your overall U-value score – while also shrinking your energy bills and your carbon footprint. The perimeter ceiling within can adorn with spotlights and speakers. This means you’ll be able to make your modern extension feel like any other room in your home, creating a space that’s ideal for entertaining or relaxing in. Is An Orangery Or Conservatory Style Better? Traditionally, conservatories have always had a high glass-to-brick ratio. Contrastingly, orangeries feature more masonry, with light delivering by an ornate-looking roof lantern. These two definitions have become blurred in recent years. A range of enhancements has been introduced that allows installers to create conservatories that look more like orangeries (and vice versa). Do Your Modern Extensions Meet Regulations? 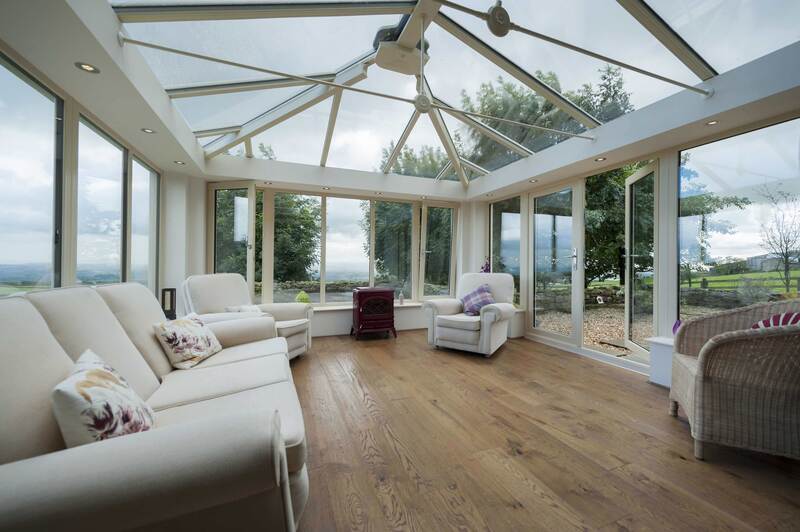 All modern extensions – and, for that matter, all conservatories and orangeries – need to meet building regulations as a legal requirement. We will make sure that your proposed build is signed off by your local authority before commencing work. Your completed structure will also satisfy local planning permission requirements. How Warm Will My Modern Extension Be? The thermal efficiency of your modern extension will depend on the design choices that we agree with you at the start. The performance glass that we use ensures your room never overheats in the summer, preventing it from becoming an icebox in winter. Your new structure will be warm and comfortable enough to use as a year-round space for any purpose that you desire. What Shape Can My Modern Extension Be? The innovative conservatory roof systems that we use are each compatible with the most popular building styles. This means that we can create stunning lean-to, Edwardian, Victorian and Gable-ended designs (and much more). Discuss your ideas with a member of the Castle Conservatories team by calling us now on 0208 669 1500. You can also book an appointment, get more advice or request a quote by sending an email to info@castlecon.com. Explore modern extension ideas by visiting our quoting tool on your tablet, mobile, home PC or laptop. It takes just a couple of minutes to use and you’ll get a free quote for your Surrey project after answering a few simple questions.